The opening ceremonies for World Ag Expo ‘18 take place on Tuesday, Feb. 13 at 9:15am. In attendance just maybe, for the first time ever, will be the current Secretary of Agriculture, Sonny Perdue. He’s scheduled to come, said Jennifer Fawkes, sponsorship manager for the show. But, whether his plane will arrive on time, and he will make it from the airport on time for the opening ceremonies remains to be seen. However, Perdue is scheduled to visit various areas of the show and he will be at a town hall type meeting, which is an invitation-only event. As in every year, there is a lot going on with educational seminars, Fawkes said. The Seminar Center is located on U Street and Expo Lane. On Wednesday, Feb. 14, at 2:30pm, AbNeo will share information on calf performance in the dairy herd and livestock. With live calves on hand, company staff will demonstrate new and innovative ideas and methods for higher performance in raising calves. Also on Wednesday, at 3pm, a seminar will be held by the Italian Trade Agency, representing 14 Italian companies and what’s new and different in Italian Ag. 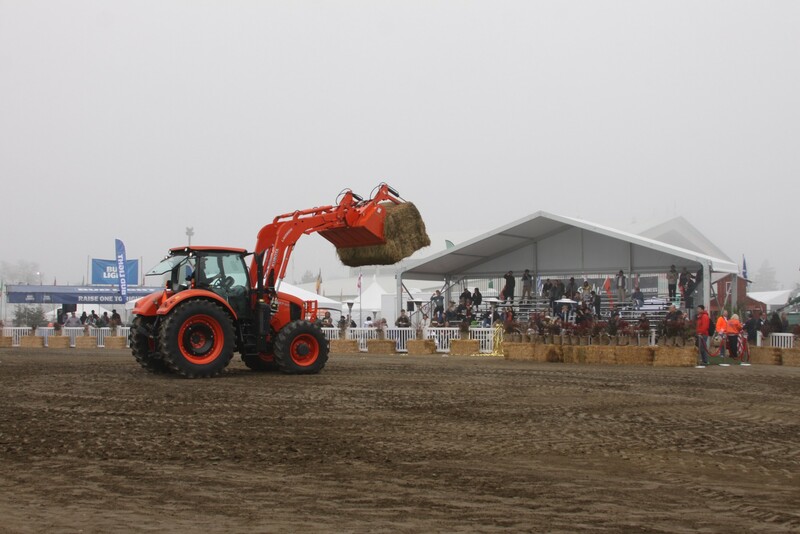 According to a representative, “Italy is the world leader in walking and specialized tractors, along with small and medium mechanization.” The best of the Italian agricultural technology will be shown at the Italian Pavilion (GS30 and GS41). One of the Top-10 New Products is a Kingsburg company, GUSS (Global Unmanned Spray System). “From a field of cutting-edge, cost-saving, and resource-managing products submitted for the Top-10 contest by exhibitors of the largest annual agricultural show of its kind” The contest judges are made up of farmers, ranchers and industry professionals. According to GUSS, it is “the world’s first fully autonomous, driverless orchard sprayer. GUSS can be used to spray almond, pistachio, walnut, citrus and stone fruit trees. It utilizes GPS, lasers, and other vehicle sensors to guide itself through orchard rows. GUSS helps alleviate the ever-growing labor challenges faced by the agricultural industry. A single operator in a control van can monitor four to eight GUSS sprayers at a time.” While not yet for sale, GUSS sprayers are available for rent in the South San Joaquin Valley, according to Fawkes. GUSS will be located in exhibit space Ride & Drive 5. Further equipment will be found in the always popular Equipment Showcase held in the arena. Located in the southwest corner of the showgrounds, here is a chance to see many of World Ag Expo’s exhibitors and products at work. The Equipment Showcase will be held daily at 10:30am and 12pm, 1:30pm Tuesday and Wednesday; 1pm and 2pm on Thursday, and 3pm on Tuesday. There’s musical entertainment, too. Bud Light offers the After-Hours Party featuring country star Craig Campbell on Wednesday, Feb. 14 from 4:30-7pm in the arena. If all the exhibits, seminars and entertainment aren’t enough, attendees can enter to win a Toyota Tundra. Tickets are $5 which, benefit the Guilds of Valley Children’s Hospital. Last year, more than $65,000 was raised. The drawing will be held on closing day on Thursday, Feb. 15 at 3pm in the Toyota exhibit space. OK, you can enter the drawing from the World Ag Expo website, www.worldagexpo.com. Last year close to 106,000 people from 43 states and 71 countries attended World Ag Expo. This year staff would like to see even more. World Ag Expo ‘18 is held Tuesday, Feb. 13 and Wednesday, Feb. 14 from 9am – 5pm; Thursday, Feb. 15 from 9am – 4pm. Tickets are $15 at the gate; $12 online with discount code ENEWS3. Vans and buses will travel from the Exeter Memorial Building to Ag Expo every ½ hour all three days, as well as from Plaza Park in Visalia. Buses also run for various locations in Tulare to reduce parking congestion at the AgriCenter.